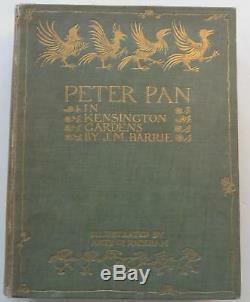 ARTHUR RACKHAM 1912 EDITION PETER PAN IN KENSINGTON GARDENS SIGNED BY J M BARRIE. SIGNED COPY, SIGNED BY J M BARRIE. ARTHUR RACKHAM, J M BARRIE. THE LARGEST AND BEST EDITION OF PETER PAN IN KENSINGTON GARDENS From The Little White Bird London: Hodder and Stoughton, . Signed, " To Judith Masefield from J M Barrie Christmas 1912", (the exact time of this books publication). 50 wonderful mounted colour plates, complete with captioned tissue guards. This copy has the incredibly rare top edge gilt, illustrated end-papers and a border around the plates, thought only to be present in the earliest copies. This 1912 edition is considered the best edition. As recorded in Riall and Latimore & Haskell. Original green/ gilt decorated cloth. All fifty mounted colour plates and captioned tissue guards are present, as called for, all the plates are in excellent condition. This is the large format, 11" x 9", 1912 Arthur Rackham Edition and is considered the finest edition with the fifty stunning mounted colour plates bound throughout the text, a new frontispiece, and with the beautiful additional full-page black and white illustrations that were not present in the 1906 edition. The covers are a bit rubbed/bumped, spine a bit faded, head and tail a bit rubbed/chipped. Inside hinges are still strong, some foxing as normal, the ink dedication is a little smudged, blotting paper smudge? The most desireable Arthur Rackham edition of Peter Pan, particularly with the dated J M Barrie signature, the first state illustrated end-paper and the border around the plates. J M Barrie signed books are extremely rare, to find a copy of his most prized title illustrated by Rackham and signed by the author is an incredible find, a real treasure. A very large and heavy book. 11" x 9" and over 2 Kilos when packed. PRIVATE PRESS BOOKS FROM THE GOLDEN COCKEREL. Plus maximum 10 days from first to last finishing date. View My Other Items For Sale. Add me to your Favorite Sellers. Please pay within 3 days, many thanks. Get images that make Supersized seem small. Tailor your auctions with Auctiva's. Attention Sellers - Get Templates Image Hosting, Scheduling at Auctiva. The item "ARTHUR RACKHAM 1912 EDITION PETER PAN IN KENSINGTON GARDENS SIGNED BY J M BARRIE" is in sale since Monday, October 29, 2018. This item is in the category "Books, Comics & Magazines\Antiquarian & Collectable". The seller is "rackham-man" and is located in YEOVIL. This item can be shipped worldwide.